This is the second leg of the Infinity Gauntlet Challenge. 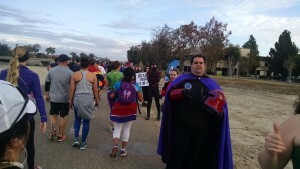 Check out Jennifer’s review of the lead-off event, the Captain America 10k. 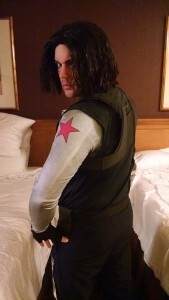 Jake rocking the Winter Soldier look. Of all the race themes offered by runDisney, this seemed the most unique and interesting. Sure, Star Wars is fun and it’s always nice to be a princess. But to be a superhero (or villain) for a day? Awesome! My only concern leading up to the race was the temperature. My costume was going to be really warm and I was hoping for cooler temps so that I wouldn’t overheat. As it turned out, I didn’t need to worry because we had perfect running weather on the morning of the half. Check out my review of the Captain America 10k for my thoughts on the expo. Mystique is ready to cause some mayhem at the race. 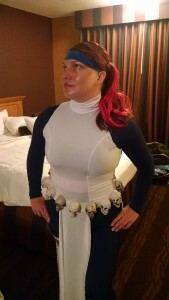 The costume: full-length high-waisted dark blue leggings and long-sleeve dark blue halter top from Dancewear Solutions, white Princess Leia dress altered to remove the arms and add leg slits, custom-made skull belt, red hair extensions, and two Hippie Runner headbands – Red Rocks and a blue version of Nessy. The rest of the gear: grey Adidas sports bra, Injinji socks, Brooks Adrenaline GTS 14 shoes, Garmin Forerunner 620 and Gymboss interval timer, and Camelbak Marathoner hydration vest. Knowing that we probably didn’t need to leave quite as early as the day before but still wanting to give ourselves enough time to get to our corrals (to avoid a repeat of the Disneyland half when we were blocked from entering our corrals), we left our hotel about an hour before the race started. This gave us enough time to hit the port-a-potties before splitting up to go to our individual corrals. For the first time, my husband didn’t stay with me because he knew he would need the extra time on course since he would be walking. So I headed into my corral, played a bit on social media, listened to an awesome version of the National Anthem by a member of the Air National Guard, and then got ready for my earliest corral release ever (since the half marathon didn’t sell out, there were fewer runners and I was bumped up a corral). I was so focused on looking for another Mystique among the cosplayers, that I didn’t even notice I ran by Magneto. I totally should have stopped for a photo with him! I’d heard a lot of negative reviews of the Avengers half marathon course, but I attributed most of that feedback to the terrible winds that plagued the race in 2014. However, having run the course, I will now agree that this is one of my least favorite Disneyland courses. From the starting line we immediately turned into the California Adventure backstage area, we then ran straight through the park, crossed into Disneyland for a little bit, and were out on the streets of Anaheim by mile 3. We spent the least amount of time in the parks of any of the races. There were, however, two things I did really like about our time in the parks: 1) When we entered the on-stage area of California Adventure, we did so through the Paradise Pier side of Carsland. This gave us the great view of the Carsland mountains at sunrise, which was one of my favorite sights on the Star Wars course (the only other course that has us enter from this direction). 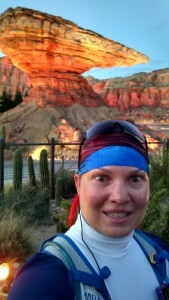 2) Although hitting the parks early in a race usually leads to significant crowding and therefore slow running, the visual of the Carsland mountains right off the bat immediately caused the crowds to break up since a good number of us stopped for pictures and allowed the faster runners to continue through. Shortly after that was a character photo stop, which helped break up the crowds even more. This is the least crowded run through the parks that I’ve ever had. 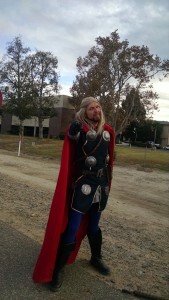 Shout-outs from Thor are rare to come by and should be treasured. The course through the streets of Anaheim was not bad, it was just kind of boring. There were a few bands, a line of superhero cosplayers on a section of the Santa Ana trail, cosplayers in historic military uniforms and active duty military personnel, and a chance to round the bases at Angels Stadium…and that’s about it. For any other race in any other city, that would be considered great course entertainment. But for a Disney race, it was a pretty poor showing. Even though the course may not have been quite as magical as a typical Disney race, I had a good experience. I worked with my coach to devise a race strategy that kept me feeling strong the whole time. I didn’t have any tummy troubles and I never hit the wall. I danced down the street with my fellow runners as one of the bands played “I Want You Back” by the Jackson 5 (I guess we all have a bit of Baby Groot in us). I cheered for the swing dancers in 1940s attire outside of Angels Stadium. And I finished a half marathon with my husband, for the first and probably only time, when I caught up with him half a mile from the finish line (though I was really tempted to run past him and beat him across). 3 shiny medals all in a row. I walked away from this race with two SMOs: a silver spinner for the half marathon and a gold Infinity Gauntlet for the challenge. The challenge medal isn’t really my favorite since it looks a bit like jelly beans glued to a hunk of gold. But I like it better than the teething ring medal from the Pixie Dust Challenge, so that’s good. Since my husband and I crossed the finish line together, all we had to do was to find our friend so we could all go into Disneyland to pick up Fastpasses for Fantasmic that night. Having successfully obtained our Fastpasses, we had to make an unexpected trip back to the race village to replace both of my husband’s medals—he lost two stones from his challenge medal and his spinner fell out. Luckily, the volunteers at the information tent had extras and we exchanged them without a problem. And having completed everything we needed to do at the parks and the race village, we headed back to the hotel to shower before going out to our traditional post-race lunch at Ruby’s. My iPod took the theme and location of the Disneyland Avengers half marathon very seriously, serving me up appropriate tunes like “Ride to California” by the Paper Tongues, “This is War” by 30 Seconds to Mars, and “Move Along” by The All-American Rejects. Sure, this wasn’t my favorite of the Disneyland courses, but I actually really enjoyed the race. I felt strong, I love the theme, and the weather was great. I’m not sure I’ll do it again but if someone wanted to buy my entry and send me a plane ticket, I would run it without hesitation. 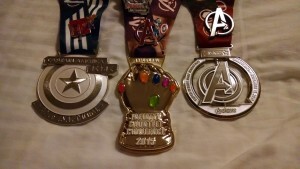 Especially if the rumors are true and the challenge medal will highlight a different Infinity Stone each year…I’m a sucker for medals in a series.